The G 7965 SCVi dishwasher and the MasterCool refrigeration products by Miele received the iF Gold Award 2019 for their design excellence. The regular iF Product Design Award 2019 was also awarded to the G 7915 SCi dishwasher, the CVA 7845 built-in coffee machine and the ArtLine, ContourLine and VitroLine design lines. These products all belong to the new 7000 generation of built-in appliances. 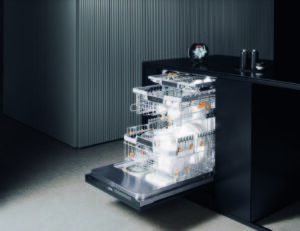 The jury issued the following statement in relation to the dishwasher awarded “Gold”: “The G 7965 SCVi is characterised above all by its excellent overall quality which includes robust and clearly structured baskets with colour highlights, high-quality materials and a robust touch panel made from glass. The product’s particularly innovative charm manifests itself in attractive and clever details – the machine door opens after a double-knock on the front and the dishwasher features the world’s first automatic dispensing system which is good for on average 20 cycles a time”. Besides, the quality and design of the MasterCool series was assessed by the jury as follows: “The MasterCool series excels in terms of its exceptional and impressive implementation! You can marvel at the dedication to detail, including the versatile and adjustable wooden slats of the wine shelf. The lighting concept and the perfect illumination of the entire interior results in a wonderful and puristic overall impression”.